In the wake of the latest G8 summit in Germany, I thought this would be an excellent opportunity to reflect on the truly international nature of the cigar industry. After all, your average premium stogie is a great example of the benefits of globalization. Take a moment and consider your favorite cigar. For the purposes of this article, I’ll choose my most recently reviewed go-to smoke: the Toraño Signature Collection Toro. Maybe I’m just easily amused, but I think it’s remarkable that the stogie’s brown maduro wrapper was grown in Brazil while the binders and fillers are products of the Dominican Republic and Nicaragua. All this from a company that has major operations in Mexico and Ecuador and sells most of its products in the United States. Call me crazy, but sometimes when I sit down with one of these excellent cigars, I think about all the entrepreneurs, farmers, rollers, truck drivers, graphic designers, ink manufacturers, marketing professionals, and administrative support that went into transforming my stogie from idea to seed to leaf to finished product. Then I think about all the people and skills that were required to make each cigar rolling implement, each farming tool, and each…well, everything. When you get right down to it, countless people play at least some minor role in the manufacture of each stick. This got me thinking about one of my favorite short essays of all time: “I, Pencil” by Leonard E. Read. A quick read and completely worthwhile, it was first published back in 1958, but its message is as relevant now as it ever was. The essay, written from the point of view of a pencil, goes on to explain how millions of workers – from loggers to miners to the numberless people who refined and fabricated each necessary component – have a hand in every pencil produced, no one of whom even knows more than a very few of the others involved, and many of whom live thousands of miles apart. Fascinating. At least to me, anyways. These truths are so easily applied to cigars (and most other products you can imagine for that matter) that each puff should be a wonderfully awe-inspiring delight. Well, maybe that’s a bit overboard. But you have to admit it is worth the thought every once in awhile. Say what you will about the G8 and globalization (and, believe me, many people emphatically do), but I count myself lucky that millions of people take the time and effort to bring great cigars to my humidor – even if they don’t realize it. All good points and definitely worth some thought. Thanks for the insightful article. By the way, that pencil essay is amazing. Who would have thought? All this is true, but you have to realize the hippies are going to be up in arms over this. According to them, globalization is to blame for all the evils of the world. Personally, I think better quality combined with a lower price can only benefit. I still think standards of living are going up. the progress paradox- things get better while some people feel worse about it?? All good comments, but I want to make clear that my intention was never to start a debate on the consequences of globalization. Rather, my intention was simply to get readers to think a bit more — and ultimately appreciate a bit more — the countless people and skills from a variety of countries that go into each cigar. 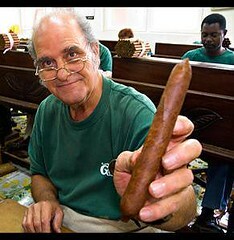 Reminds me of a very funny moment during "Frasier" where Martin got a hold of a box of confiscated Cuban cigars. At one point, Niles and Martin are smoking the sticks and singing old songs by the piano. Niles opines "did the Cuban who rolled these cigars have any idea that he'd be bringing a father and son closer together?". To that, Martin replies "yeah..it makes the dime he earned just that much sweeter".